Haven't been posting for a while as things have been crazy busy, so busy that the Very Understanding Girlfriend and I have decided we need a holiday. We've decided to pack up our troubles in our old kit bag and head out to the Seychelles for a few weeks in November. It's been over eight years since I have taken more than a week off from work, so I'm not sure how my system will cope with the lack of email, phones, computers, doublebooked calendars, pointless meetings and sixty hour weeks. I think I might be in danger of relaxing. 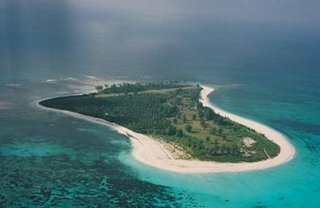 We're going to go to Bird Island, an ecolodge on an atoll filled with birds and turtles. And not much else. My only concession to technology on this trip will be i) an iPod and ii) a solar charger for the aforementioned 'pod. Desert Island Disks isn't as challenging a game to play with 60 gigs. I think that says it all. Pictures will be forthcoming? Have fun snorkeling - I hope you don't get bit by a fish again! hmmmn - tx for the memory. Unkie Dave does not like water. Unkie Dave does not like swimming. Unkie Dave is convinced by 'friends' to go snorkling. Unkie Dave goes snorkling in 2 feet of water and gets stung by a jellyfish. The sea is trying to say something, it says' "Unkie Dave, this is not for you"
Is this your way of telling us that you'll be on the next season of Shipwrecked?